Righteous Path Music Productions is the name of ​my recording and publishing company. All of my music has been produced and published under the RPM Productions label. 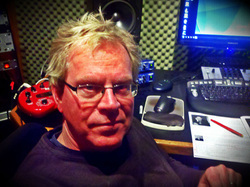 Nutshell Studio is where I record and produce my music for kids & families. 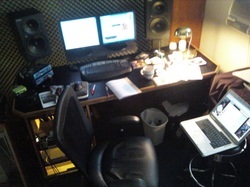 It's called Nutshell Studio because it started out in one very small room. But over the years it has grown to become a full fledged digital multi-track recording and post production facility. I've never really advertised my studio for others to use but from time to time I'll meet someone who is looking to record something and I've made the studio available. In last couple years I've produced several projects from full length CDs to theme songs and jingles... it's become really fun for me to branch out in new ways and lend my experience and resources to others looking to create something new. I've had the opportunity to produce several independent projects from a capela groups, full bands, solo demo projects, sound effects for stage productions, jingles, theme songs and more. If you need some help moving your musical creations forward to the next level... or if you need a theme song, jingle or original music or sound effects for a video project or stage production maybe I can help. I don't know it all but I've been doing this long enough and made enough mistakes that I've learned a few things over the years. I would be glad to help as much as my schedule allows from answering a few questions to producing your next record and everything in between. I've also successfully worked with musicians who live in other parts of the world... sending audio files back and forth, bringing in studio players I use or singing and playing on records myself. In addition I do editing, mixing and mastering on projects that have been recorded in bedroom studios or small project studios. Send me a message from the contact page or drop me an e-mail. I can give you an idea of hourly rates for recording, editing, mixing or mastering and flat rates for specific projects like theme songs, jingles and sound design for video and stage productions. I try to work with all kinds of budgets especially for young musicians just getting started. I know how much I appreciated people who were willing to lend me a hand when I was getting my feet wet. So please let me know if I can do the same for you.